In the Bathroom Solutions Blackpool and Fylde Sunday Football Alliance Premier Division FC Shovels remain five points clear. Goals from Jake Darnell(2), Tom Ashworth, Connor McGough and Kurtis Trinder gave them a 5-2 win against the Saddle for whom Bradley Gill and Chris Morris scored. There were two goals each for Kenny Cram and Darren Heaney as Broomheads Estate Agency beat Bloomfield Brewhouse 6-2, while Dax Hoogerwerf and Adam Heaney also scored. David Warburton scored his fifth in five games as Exceptional Kitchens drew 4-4 with 21st Century Windows. Oliver Johnson, Ben Newman and Adam Zyda also scored and David Giles(2), Nitisat Sirisom and Luke Wilks replied. In the first division Highfield Social had another win, this time at Anchorsholme with Craig Worrall netting two, while Ben Fenton and Calvin Ross also scored in their 4-1 win. The Station Lytham played second-placed New Albert and were 1-0 ahead through Tom Bell. A penalty and red card saw the game tied at 1-1 with Scott Salanki converting before AJ Greenwood scored a stunning goal to make it 2-1. Station hung on for the win with stand-in keeper Paul Allen hardly tested. In the battle at the bottom of the table, Wesham beat AFC Jewsons Blackpool 5-2 thanks to Rick Tomlinson (3), Ashley Walsh and Josh Kirkman with Sam Bannister and Matthew Duke replying. Westview closed the gap on division two leaders McNaughtons, who didn’t play, with a 7-3 victory over the George with goals from Steven Rankine (3), Alex Trushell(2), Sam Firman and Aiden Wintrip; BJ Whittle(2) and Matty Hole replied. Clifton edged out Marshall Court in a five-goal thriller as Rob Hanslip grabbed a brace and Harry Gornall the other with Lee Fleetwood and Stuart Hammond scoring for Court. Boars Head were stunned by Layton Seniors 5-1 with goals for Sam Daniels(2) Alex Louden, Joel Watson and Josh Johnson with Rob Heritage netting a consolation. Kirkham Town had a 12-2 win against Wrea Green with Michael Morcombe scoring five and further goals from Jason Lee, Kieran Leaman, Chris Danson, Rian MacDonald, Kevin Beig and Stuart Allen, while Josh Williams and Paul Taylor netted. Tom Harrison (3) and Daniel Dean scored for Highlands as they drew 4-4 with King Edward for whom Ryan Willetts (2), Sean Willetts and Ryan Holland scored. In the Gledhill Cup, the Layton Pub beat Blackpool South with Rick Fisher (2), and Karl and Shane Mcleod giving them a 4-1 win. Garstang closed the gap at the top of the West Lancashire Football League’s Premier Division with a stunning 8-3 win at Coppull United. Alan Coar was the star of the show as he bagged himself four goals, three of which came in the first half. 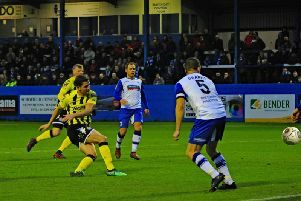 Marc Murphy, Shaun Sailor, Jake Salisbury and Tom Entwistle also found the back of the net for Lee Baker’s Riversiders. Hepple, Ryan Doherty and Martin Kershaw bagged Coppull’s goals but it wasn’t enough to stop Garstang cutting the gap to league leaders Blackpool Wren Rovers to just three points, with two games in hand still to play. That comes after Wren Rovers went down to a shock 2-0 defeat at home to Tempest United. Jordan Coop and Chris Farnworth netting the goals within the last 15 minutes to condemn the hosts to their third defeat of the season. Elsewhere in the Premier Division, Thornton Cleveleys picked up a 2-2 draw away to high-flying Euxton Villa. Mick McAlpine handed Thornton the lead just before the half-hour mark only for Euxton to hit back with two quickfire goals in the second half, Patrick Bibby and George Davies with the goals. But Dominic Lawson equalised 12 minutes from time to secure the point for the visitors. In Division One, Poulton kept up the pressure on league leaders Milnthorpe Corinthians with a 5-0 win at home to CMB. Max Landless grabbed the match ball with a hat-trick while Allan Thompson and Damian Green also got their names on the scoresheet. Poulton remain level on points with Milnthorpe after their 9-1 victory at Askam United. A Ross Ainsworth brace helped Lytham Town beat Mill Hill St Peters 4-1. Nathan Cook and Danny Scarlett also scored, with Ryan Walton replying for the hosts. Wyre Villa went down to a 4-2 defeat at home to Stoneclough. Zach Crosbie and Jarred Bain netted their goals.